I find this great idea for blind corner cabinets storage! When at home, I used to clear up my kitchen cup boards with all the unnecessary stuff, so looking for things I need would be relatively easy. However, when it comes to those kitchen cabinets underneath the sink, sometimes, you even have to use a flash light just to be able to find those stuff hiding at the corners of the cabinet. I don't know that there is a best variety of lazy susans which can address this problem. 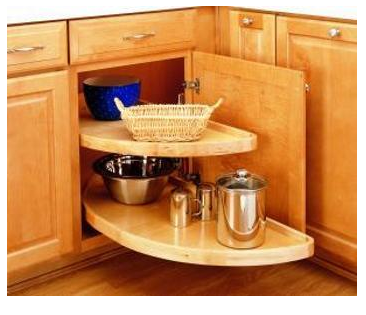 Take a look at this 32 inch classic half moon lazy susan. Easy to install and comes with a clear coat finish that could match any cabinet. Cool!